March 19, 2019, Austin, TX. Heart and Sold Austin, powered by Keller Williams Realty, the Luxury Division - Thank you to my clients, business partners, supporters and friends for helping to make this possible. 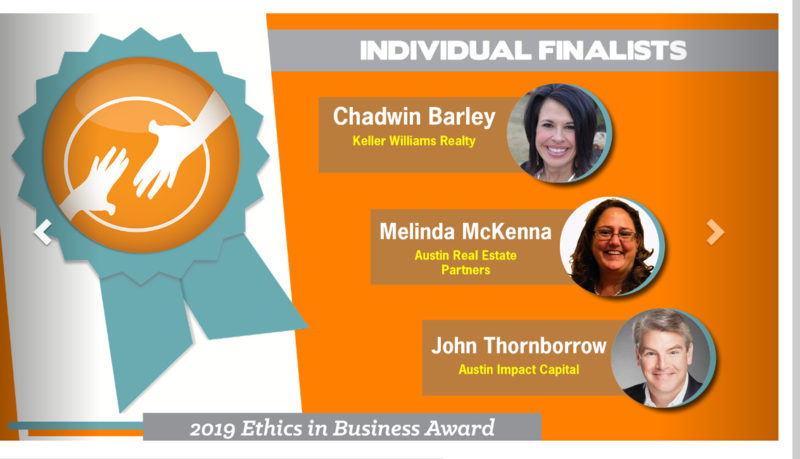 According to Recognized Good, "The Ethics in Business Award recognizes the best in Central Texas leadership on the pillars of respect, fairness, honesty, justice, and sustainability." It has always been my objective to make my Real Estate business more about people than it is about property. The mission of our business is to "give back and to encourage others to do the same." My vision is to always put my clients needs first and to exceed their expectations every step of the way. I look forward to meeting with the decision-makers who will determine which of the finalists actually wins the prize...and as finalists we are already winners!